7:15pm – Presentations start. Mike Veale opens with GCF conservation project updates. Join us for an evening discussing #Rhino conservation, rehabilitation, and protection by our special guests, Dagmar Midcap, and Dr William Fowlds. . Each guest will have ample time to ask questions and enjoy conservation conversations with the GCF directors, Dagmar Midcap, and Dr William Fowlds. Dr William Fowlds is known for his work in awareness and education of the poaching crisis and its impact on animals and people alike. Living in South Africa and practicing veterinary medicine he has been part of the “front-line” fight to save rhinos from extinction with his work. 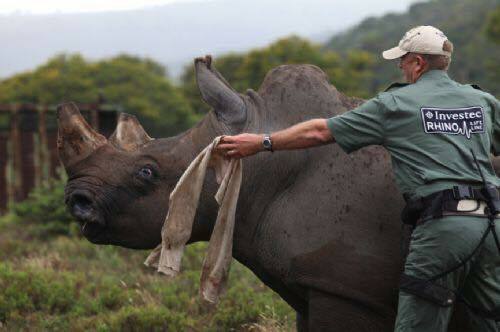 Global Conservation Force is proud to be conservation partners with Dr William Fowlds and his rhino saving efforts. GCF works strategically with Dr Fowlds and reserves in the Eastern Cape of South Africa to bolster protection and conservation efforts for wild rhino.